Obon festival is an annual Buddist event for commemorating our ancestors. It is on 13th August or July (depens on the place) here in Aichi is in August. we believe the ancestors' spirits return to this world in order to visit their relatives each year during Obon festival. 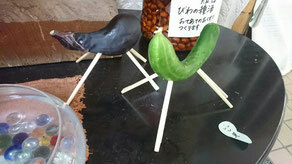 We make cucumber as a horse and an eggplant as a cow, returning our place fastly to ride house then backing slowly to their world.